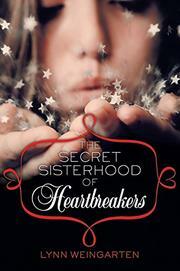 High-school temptresses wield magic to emancipate a lovelorn girl from her pain in this finely wrought tale. Weingarten (Wherever Nina Lies, 2010) begins like the Old Testament, an apt reference for a story rich with spirituality and what are for sophomore, Lucy Wrenn, challenges of biblical proportions. Lucy is desperate to win back Alex, who dumps her on the first day of school. In sentient and original metaphors, Weingarten evokes the poignancy of unrequited love so well that readers will cheer Lucy on in her mission to satisfy the mandates of the trio of glamorous girls comprising the eponymous sisterhood. Lucy can thus attain enchantments to use on Alex. The tale has its Mean Girls moments when Lucy’s teetering virtues shine through, but nothing is entirely what it seems and readers can determine themselves whether the sisters are friends or foes. Shy and unassuming, Lucy struggles to flirt as instructed, in hopes of joining their ranks, and readers who enjoy fashion and cosmetics will relish her physical transformation. Lucy’s journey celebrates the complexities of friendship and family and teaches her to appreciate the ordinary. Surprises and close calls abound as Lucy’s priorities evolve and Weingarten raises questions teens will enjoy considering.